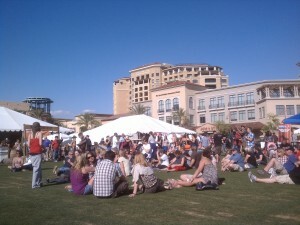 The weather was perfect and this awesome event organized by David Tyda and his partner Rick (http://azbbqfestival.com/) brought out the crowds at the 2nd Arizona BBQ Festival in Scottsdale, Arizona. 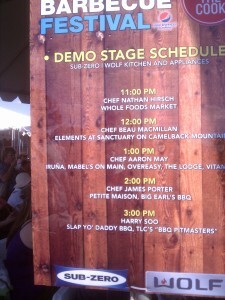 As in last year, I was invited to be a guest instructor at the Sub Zero stage where top local chefs were featured every hour. It was fun sharing my passion for cooking baby back ribs and Benny and Shari handed out rib samples to over 120 attendees. I served it with my Asian Slaw w Thai Basil and a Chili Lime Vinaigrette which was a hit with the crowd. Many thanks to Tommy Duncan of Whiskey Ranch for helping out and cooking the case of ribs in his beautiful FE 750 rotisserie pellet smoker. 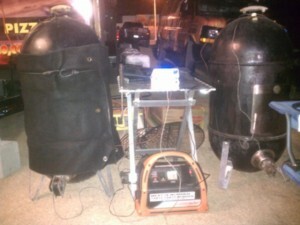 We continued to test our new and improved recipes for the 2011 contest year with mixed results. We believe we’re on the right track but not all the judges agreed. After looking at our scores, we had two meat categories where two judges gave us 6’s for taste while others gave us 9’s. So it was two steps forward and one step back with this love-hate flavor profile we’ve been experimenting with. We finished 11th in a field of 37 with 7th Ribs, 11th Pork, 15th brisket, and 17th chicken which was not surprising considering we’re pushing the envelope to take our BBQ to the next level. Based on past experience, it takes a while to test and debug new flavors and techniques. Sometimes they work and sometimes they bomb. A big part of the fun of competition BBQ for us is to constantly challenge ourselves and never to assume that “if it ain’t broke, don’t fix it.” Whether it was a “rookie Hail Mary” in 2008, “small fish in big pond” campaign in 2009, or “steady as she goes” in 2010, or “pushing the envelope” in 2011, you can rest assured that we’re having immense fun doing what we do. As you will often hear us say it, “the worst day BBQing is still better than the best day at work!” Our preoccupation with meat, smoke, and rub may raise eyebrows and generate questions as to our sanity but we’re having the greatest time doing what we do! It was super to see more all female teams like BBQ Phoenix and the return of Mad Momma at cooking contests which are pretty much dominated by male pitmasters. A big shoutout and congrats to Tracy and Chris of BBQ Phoenix for their first- time walks and 5th overall at this contest. Boy were they excited as this was the first time they walked (go on stage) after competing since last year in 7 contests without ever taking a walk. In BBQ as in life, tenacity and perseverance will be eventually rewarded! Congrats to Swine Assassins from Iowa who took GC and Rhythm & Que for RC. Congrats to all who walked. Thanks to Carol and Merle our KCBS officials, judges, and helpers. 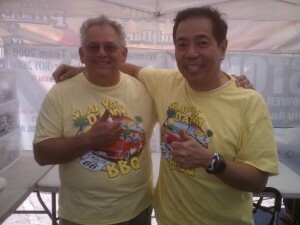 Thanks to our sponsors and David Tyda of eateraz.com to taking care of us.